Home » Original writing » A Spooky Story. The green book cover intrigued her. She moved closer to get better look. She marveled at the gold tooling around the outer edge of the cover and along the spine. The intricate pattern of repeating scrolls and swirls imprinted itself on her mind, floating up towards her. She closed her eyes, screwing them tightly to shut out the after image. When she dared to open them again it was to focus on the symbol in the centre of the cover. It shimmered with a strange lustre. Gold, yes, but somehow more exotic than mere gold. 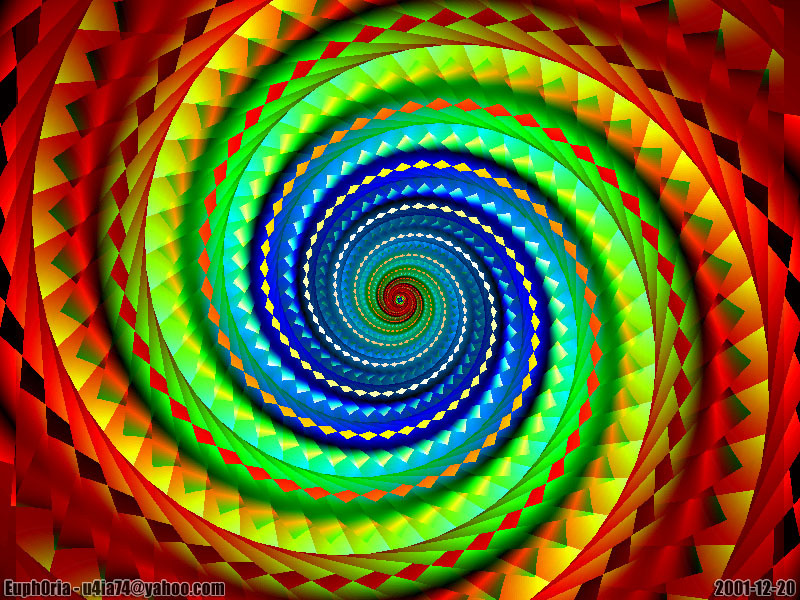 There were all the colours of the rainbow, and more, spiraling around a central void, sucking her into its mysterious interior. Again she closed her eyes, fighting the urge to allow herself to be drawn deep into a place she sensed held unknown dangers. She turned and walked away. She found a seat under a high window. The softness of its cushions embraced her. She breathed deeply, trying to calm her pounding heart. What was it about the book that produced this strange effect in her? There were, she now realised with a start, no words on the book’s cover. She sneaked a sideways look at the spine. Even from this distance it was clear it contained no words either, just a smaller copy of the strange symbol on the cover, bounded by more scrolls and swirls like those that surrounded the cover. She immediately averted her eyes, afraid of being attracted by its magnetism. For the third time in as many minutes she closed her eyes. Leaning back into the softness of the seat’s upholstery she placed her hands on the silk brocade cover and began to trace with her fingers the raised pattern woven into it. Her body stiffened and she snatched her hands away. It was the same pattern as the book cover! Was there no escaping the vortex that threatened to engulf her? She stood still, fighting the urge. ‘Alright,’ she told the voice, ‘Just a glance.’ Two paces brought her back to the seat. One more would take her to the table. She hesitated. Took a diffident half step forward and another sideways, so that she could more easily see the page ends. Gold edged and, she now saw, secured by a gilded clasp. If she was careful, perhaps she could open the clasp and riffle the pages without looking at the mesmerising patterns on the outside. Tentatively she extended her right arm and placed a finger under the clasp to lift it. An electric shock traveled at lightening speed up her arm. She pulled her arm back and shook her hand, looking around for something inanimate with which to probe the clasp. She opened her bag and took out a plastic shoe horn. With a deft stroke she lifted the clasp and followed through, flicking the cover open. At once she saw that the object she had taken to be a book was, in fact, a box. She stepped forward to examine the contents of the box. The void took her. Cackling laughter echoed then faded as she spun into the vortex, the seat and the table bumping against her as they, too, were consumed. Image from euphOria; Made with Fractint. A geometric spectral vortex. Not even light can escape, it only manages to shift around. By franklparker in Original writing on October 23, 2015 .